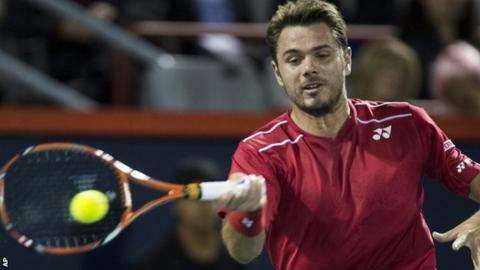 French Open champion Stan Wawrinka has urged the governing body of men's tennis to act on "unacceptable" comments made by Nick Kyrgios about his girlfriend in their Rogers Cup tie. On-court microphones apparently picked up the Australian, 20, making a lewd suggestion about Wawrinka's girlfriend. "There is no need for this kind of behaviour," said the Swiss, 30, who withdrew from the match through injury. "I really hope the ATP will take major action against him this time." Speaking on court after progressing from the second round in Montreal, Kyrgios claimed he had been provoked by the world number five. Kyrgios said: "He was getting a bit lippy with me. Kind of in the heat of the moment, I don't know, I just said it." However, Wawrinka believes the Tour should take action over the latest controversy surrounding Kyrgios, which follows his often-petulant performance at Wimbledon in July. Kyrgios was booed by the crowd when he appeared to stop trying in the second set of his fourth-round defeat by Richard Gasquet and clashed twice with umpires during the championship. Wawrinka added: "It's not the first time that he has big problems on court in terms of what he says and in terms of how he acts. "I hope the governing body does not stand for this." Kyrgios, who made his big breakthrough when he knocked Rafael Nadal out of Wimbledon in 2014, is expected to play in Australia's Davis Cup semi-final against Great Britain in Glasgow next month.